Premises Liability Lawyer Colorado - Bell & Pollock P.C. Where you work, shop or even go to hang out with loved ones may not be as safe as you expect. In fact, although building owners and managers are bound to a certain duty of care when it comes to their properties and facilities, these parties do not always live up to their obligations. This type of negligence and carelessness can contribute to unsafe premises, increasing the risk of accidents and injuries. At Bell & Pollock, P.C., our Denver personal injury attorneys are all too familiar with how unsafe premises and negligence can lead to catastrophic injuries. That is why we are proud to be champions for the people, advocating their rights and defending them against injustice so they can reclaim their lives and financially recover after being harmed by others’ negligence. After being hurt on an unsafe property, contact a Denver personal injury lawyer at Bell & Pollock for experienced help pursuing justice and obtaining compensation. Private and public premises can be unsafe for a variety of reasons, many of which can result from the responsible parties failing to take “reasonable” care to keep their properties safe. Such reasonable care can involve promptly repairing or rectifying safety issues that owners or managers have been aware of. It can also involve situations in which a responsible party should have been aware of some risk of danger because a “reasonable” person in the same situation would have been aware of it. Failing to promptly and appropriately fix any problem that makes a property unsafe. 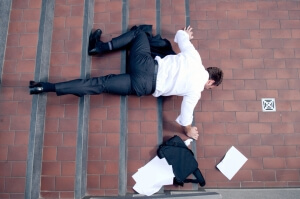 Stairway, elevator and/or escalator accidents. Trespassing – In other words, the injured person must have had a right to be on the property in order for a premises liability claim to exist. The injured person’s negligent behavior – When people are injured on others’ property as a result of their own careless or reckless behavior, they can’t sue others to allege their dangerous property conditions harmed them. If you have been injured as a result of the unsafe conditions at any public or private property, you can turn to a Denver personal injury attorney at Bell & Pollock, P.C. for experienced help advocating your rights and pursuing justice.